The Urban Politico: Hypocrisy at its Finest! 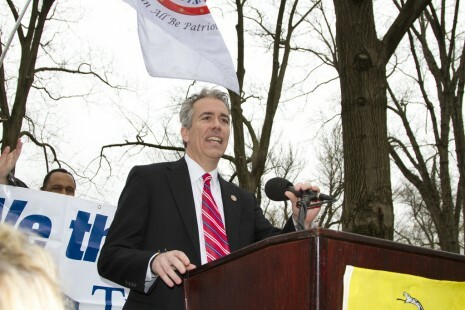 Joe Walsh is a member of the Freshman Class of Tea-Party Republicans, who were swept into Congress to "restore fiscal sanity" to Washington. These members of the Republican Party, ride a platform of family values and often cite their children and grandchildren as reasoning for policy decisions. It seems that Joe Walsh is not qualified to define what fiscal sanity is and knows nothing about family values. According to a law suite filed by Walsh's ex-wife Laura Walsh, Joe owes her more than $117K in child support for a period dating November 2005 to December 2010. During this time, Walsh made partial or no payments. Prior to his election to Congress, Walsh states that he was unemployed and unable to make the agreed upon child support payments in full. According to Congressional Financial Disclosures, Walsh loaned his 2010 congressional campaign $35K and also paid himself back $14k for the loan. Where did Mr. Walsh get the $35K to loan his campaign and why did a congressional campaign take precedence over his children. Walsh also took a vacation with his companion to Italy and Mexico. "The apparent availability of large sums of money from either his employment, his family or his campaign has allowed him to live quite a comfortable lifestyle, while at the same time, due to his failure to pay child support or any of his share of the education costs or medical expenses, Laura and his children were denied any of these advantages." The people of Illinois 8th Congressional District should be grateful, that Mr. Walsh has given them an accurate portrayal of his morals and character. Constituents across the country should also take a lesson and connect Mr. Walsh to his tea-party colleagues in Congress. The hypocrisy spreads across the tea-party caucus and should be taken seriously. How can we trust a member of Congress to represent their constituents and put the interests of the constituents above their own, when they won't even do the same for their children? My heart goes out to Laura Walsh, it's difficult to raise children without the help of the other parent. If you were unemployed and behind on child support payments to your former spouse and had access to funds from other sources, would you finance a congressional run or give the money to your former spouse for your children?